Currently, Indian legislation allows for the open use of drones with a take of weight below 250 grams when flown below 500 feet. However, as with most national aviation authorities, there are number of restrictions and limitations surrounding the use of larger drones for commercial use (UAV Coach, 2018). Recently, the potential economic, technical and social advancements that the age of drones has ushered in, has caused the Indian Ministry of Civil Aviation to look outside of its borders to identify how to best utilize the latest drone technologies to develop their agriculture and construction industries. To illustrate the advantages and capabilities of drone technology in the agriculture industry, Ace Aviation fired up the impressive Xaircraft P20 (which has a max take of weight of 25kg). As the current pinnacle of agriculture specific UAV technology in Australia, the drone was used to spray a 7.5-hectare field of grass to demonstrate its autonomous capabilities. During the demonstration, Ace Aviation also demonstrated the other capabilities of the P20 including mapping, crop growth & health monitoring, aerial crop scouting, thermal imaging, herbicide and pesticide management and early identification of emerging weed and insect threats. Integration of the P20 into agriculture operations not only reduces manual labor and its associated inefficiencies and costs, but also allows for risk management and early identification of potential threats to a yield. The demonstration was successful in demonstrating the sustainability and economic superiority of integrating drone technology e agriculture industry. In addition, the Ace Aviation team demonstrated the DJI M600’s (16kg) capabilities in the context of the construction industry. Drone technology has the capability to efficiently generate 3D volumetric displays, such as vertical mapping, complete construction growth predictions, monitor site and risk management and produce digital surface models. This allows companies to predict the feasibility of each project and establish hazardous areas, reduce project budgets and time spent while increasing efficiency and safety to the work force. Theoretical briefs and preparations for the ECI delegates were delivered onsite at our Mt Gravatt campus, with practical training and assessment held at Dittmer Park. Over the course a 5 day intensive program, Ace Aviation delivered 4 units of competency towards the ECI staff’s Certificate III in Aviation (Remote Pilot- Visual Line of Sight). The RePL training consisted of both theoretical and practical components which not only taught the ECI delegation how to handle and maneuver a remotely piloted aircraft but also taught them the importance of aviation radio etiquette and safety. By the end of the course, all members of the ECI were highly proficient and able to train others in flight, how to monitor data and identify opportunity gaps and vulnerabilities as well as how to apply mapping and surveying capabilities into the construction and agriculture industries. Drone technology is maturing. It is becoming more accessible and affordable while streamlining and optimizing almost every industry across the globe. It minimizes inefficiencies associated with manpower while maximizing control, sustainability and profitability. Most importantly, the booming drone industry is creating jobs. 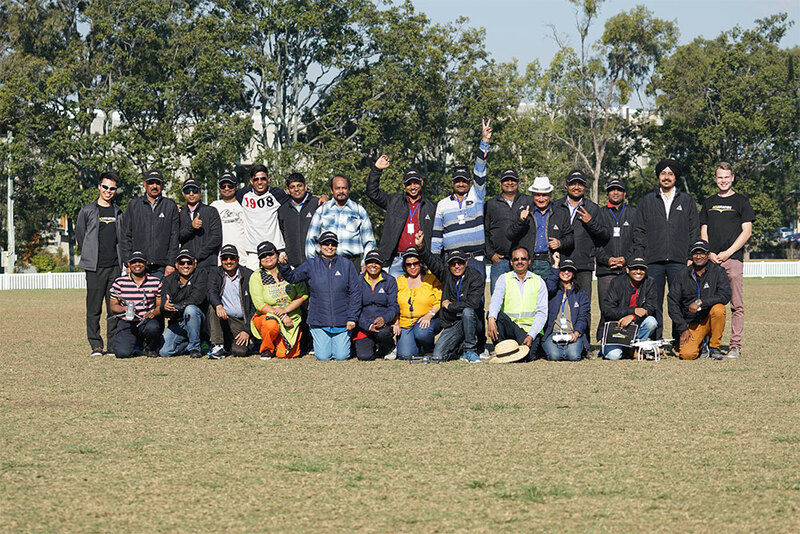 It was an honor to have the ECI delegates learn from us and we know that through the training we have provided, they will evolve the Indian drone industry and accomplish incredible results. They were a highly competent group and we at Ace Aviation are privileged to influence international drone laws and promote its integration. As an industry leader we have a genuine interest in upskilling the workforce and providing transferrable knowledge and skills to make all of our student’s industry leaders in their respected fields.